The Tea Party flexed its muscle. Michigan Public Radio Network's Rick Pluta and Laura Weber report, "A defiant effort to put a tea party candidate for lieutenant governor on the ticket instead of Snyder's choice of state Representative Brian Calley stopped the convention in its tracks. Party leaders tried to restore order ... Snyder got his choice, but only after the tea party candidate ended the insurgent effort by withdrawing." "People power vs. Pundit Power." Polls show he has a long way to go to catch Rick Snyder, and some pundits don't think he can make up the ground. The Associated Press reports that Virg Bernero entered the convention to the theme of Rocky saying "we knew better then, and we know better now. We know that 'people power' beats 'pundit power' every time." Two Mayors make up the Dems ticket. 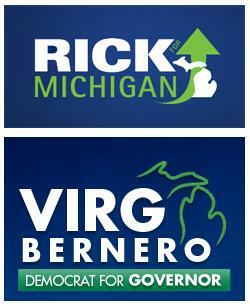 Democratic Gubernatorial candidates Virg Benero selected Southfield Mayor Brenda Lawrence as his running mate. Craig Ruff said in The Lansing State Journal ""My rule is nobody votes for lieutenant governor. What you want is a safe choice, somebody who won't embarrass you, won't be a distraction to your campaign. From all accounts, she'll be able hold her own in a debate between her and Brian Calley." "The Constitution made me do it." You can't vote in the primaries for certain offices because the Michigan Constitution says candidates must be selected at political conventions.